CHAMPIONSGATE, Fla. – The moment many U.S. men’s national team fans have been anticipating for nearly a year and half has finally arrived. Ever since the colossal and inexcusable failure to qualify for the 2018 World Cup birthed the darkest moment in the program’s modern history, USMNT supporters have been eager to finally, fully turn the page. That couldn’t happen last year under interim coach Dave Sarachan, even as Bruce Arena’s former assistant blooded a slew of genuinely promising youngsters. 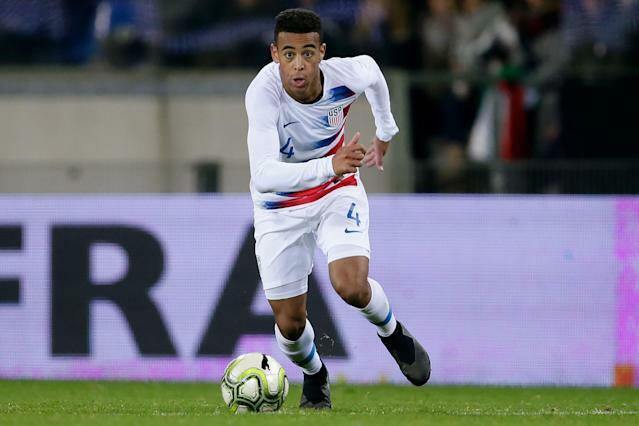 It couldn’t happen under new boss Gregg Berhalter during his first two games in January and February, not with most of America’s top players — most notably 20-year-old standouts Christian Pulisic, Weston McKennie and Tyler Adams — unavailable because of commitments to their European clubs. Now Berhalter has his full-strength squad together at long last. 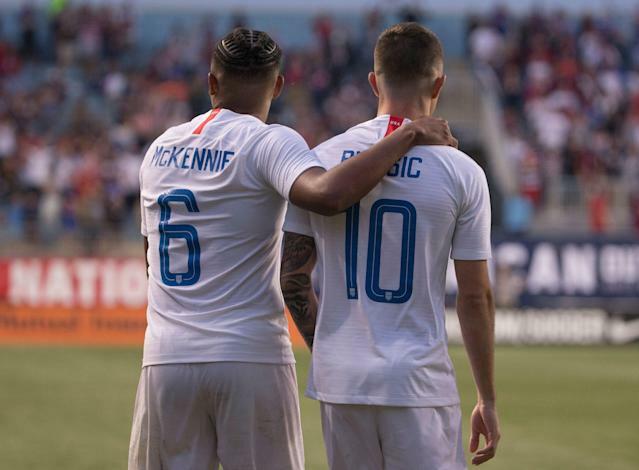 And when the Americans take on Ecuador on Thursday in a friendly at Orlando City Stadium, it should also mark another significant milestone: the first match that Pulisic, McKennie and Adams will start together for the USMNT. Those are bold words, no question about it. Yet the fact remains that the Americans, who made seven straight trips to the planet’s premier sporting event before falling short with that shocking defeat in Trinidad in late 2017, have never had three players as young as Pulisic, McKennie and Adams all excelling in the German Bundesliga – and in Pulisic and McKennie’s case, the vaunted UEFA Champions League – at the same time. That sort of pedigree has supporters cautiously optimistic that the U.S. will eventually burnish its tattered reputation on the global stage. Pulisic, McKennie and Adams have remained close friends since their days with U.S. youth national teams. Adams, who only moved to RB Leipzig from the MLS New York Red Bulls in January, stayed at Schalke handyman McKennie’s house after their teams met in a league match Saturday before flying to Florida together the following day. In addition to their individual quality, there’s an on-field chemistry between the three. “Fun” is not how anyone would describe most of the last two years for the USMNT. While the wounds from the qualifying disaster have for the most part healed, deep scars remain. For all the next generation’s talent, the hard reality is that the USMNT’s 40-deep player pool doesn’t come close to matching the talent available to countries like Belgium or Uruguay, let alone World Cup winners such as Brazil or France. For the U.S. to succeed, a team-first mentality is essential. Disharmony combined with an aging roster went a long way toward torpedoing the Americans during the 2018 cycle. “Our job as coaches is to foster that chemistry (so) that we can overcome potential talent deficits,” Berhalter said earlier this month. A cohesive game plan is essential, too. Berhalter is a tactics wonk who has spent much of the last few months trying to get his players, whether they’re based in Europe, Mexico or MLS, on the same page via face-to-face meetings and remote video sessions conducted via Skype. Still, growing pains are to be expected. They have to start somewhere, though. With Pulisic, McKennie and Adams all expected to be in the same lineup for first time, Thursday offers that chance.